Structural controls on orogenic gold mineralisation in the Otago Schist, New Zealand and the Klondike, Canada. Orogenic gold mineralisation in schist terranes with few or no contemporaneous igneous intrusions is poorly understood. It is proposed in this thesis that the structural evolution of such terranes controls the generation of hydrothermal fluid pathways and thus the location of orogenic mineral deposits. Gold mineralisation in the Otago Schist, New Zealand and the Klondike Schist, Canada occurred in the latter phases of greenschist facies metamorphism as well as after metamorphism during Paleozoic-Mesozoic exhumation. In Otago, gold mineralisation occurred at a number of different times and structural levels as the schist belt was exhumed and rocks were brought up through the brittle-ductile transition. In Klondike Schist, gold mineralisation occurred in relatively brittle rocks after a period of regional compression and crusta! shortening caused by the stacking of thrust sheets. Gold mineralisation in both schist belts is not associated with any coeval igneous activity. The earliest stage of gold mineralisation in the Otago Schist occurred in the Jurassic when mineralising fluids were progressively focussed into late metamorphic ductile shear zones such as the Hyde-Macraes Shear Zone (HMSZ), east Otago and Rise and Shine Shear Zone (RSSZ), central Otago. Both of these gold-bearing mineralised zones occur along mappable structural discontinuities or boundaries that separate structurally, metamorphically and lithologically distinct blocks. The HMSZ occurs in the hangingwall of an underlying low angle normal fault that juxtaposes mineralised lower greenschist facies rocks on to unmineralised upper greenschist facies rock. The RSSZ occurs in the footwall of an overlying low angle normal fault that juxtaposes unmineralised lower greenschist facies rocks on to mineralised upper greenschist facies rock. The two shear zones did not form as part of a single homogeneous structure. There are several other prospective late metamorphic boundaries that are different from later brittle faults that disrupt the schist. Late metamorphic gold mineralisation is characterised by both ductile and brittle structures, foliation-parallel shears, disseminated gold with sulphides in deformed schist and minor steeply dipping extensional veins. This style of mineralisation is the most prospective but can be subtle in areas without quartz veins. Hydrothermally altered rocks are emiched in gold, arsenic, tungsten and sulphur with minor emichment of bismuth, antimony, mercury and molybdenum. Disseminated mineralisation in the HMSZ is associated with hydrothermal graphite, however there is no hydrothermal graphite in the RSSZ. The next stage of gold mineralisation occurred in the Cretaceous during post-metamorphic exhumation of the schist belt and is characterised by steeply dipping, fault-controlled quartz veins, silicified breccias and negligible wall rock alteration. Most post-metamorphic veins strike northwest such as the ~25 km long Taieri river gold vein swarm, but there are other stibnite and gold mineralised structures that strike northeast (e.g., Manuherikia Fault system) and east-west (e.g., Old Man Range vein systems). The latest recognised stage of gold mineralisation is controlled by structures related to the initiation of the Alpine Fault in the Miocene and is characterised by steeply dipping quartz veins with abundant ankeritic carbonate in veins and ankeritic carbonate with gold in altered rocks. Hydrothermally altered rocks are emiched in arsenic, carbon dioxide and sulphur with minor emichment of antimony. Gold-bearing veins at Bullendale, central Otago are of this type and are associated with a broad alteration zone. Gold-silver and gold-silver-mercury alloys occur in both Caples and Torlesse Terranes of the Otago Schist. Almost all mercury-bearing gold occurs in east Otago vein systems and 1 mercury-free gold occurs in central and northwest Otago veins, irrespective of host terrane. There is no relationship between depth of vein emplacement and mercury content of gold. 11 The Klondike Schist was emplaced as a series of stacked thrust slices in the Jurassic and thrust-related fabrics are preserved in all thrust slices. Strongly deformed carbonaceous schist horizons are spatially associated with thrust faults and graphite within these units is concentrated along spaced cleavage surfaces. Kink folding is best developed in the uppermost slices of Klondike Schist and overprints thrust-related fabrics. Gold-bearing veins formed in extension fractures controlled principally by pre-existing weaknesses such as kink fold axial surfaces. Normal faults correlated with a period of Late Cretaceous regional extension crosscut kink folds and offset gold mineralised veins. The main stage of mineralisation occurred after major regional compression and thrust stacking and before Cretaceous normal faulting. Gold-bearing veins are widely dispersed throughout the uppermost slices of Klondike Schist and are considered to be a sufficient source for Klondike gold placer deposits. Disseminated gold with pyrite is associated with gold-bearing veins in some Klondike Schist and this disseminated mineralisation expands the exploration target for these veins. Disseminated gold and pyrite, without quartz veins, occur in some schist lithologies and are associated with chlorite alteration and weak silicification. The arsenic content of goldmineralised Klondike Schist is much lower than mineralised Otago Schist and background concentrations of arsenic are much lower in Klondike Schist as well. No shear-related mineralisation has been discovered in Klondike Schist but due to its relatively poor exposure, this belt remains prospective for this style of mineralisation. viii, 224 p. ill.; 30cm. 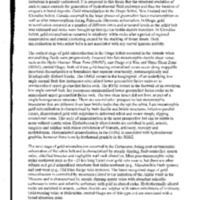 MacKenzie, Douglas James., “Structural controls on orogenic gold mineralisation in the Otago Schist, New Zealand and the Klondike, Canada.,” Otago Geology Theses, accessed April 22, 2019, http://theses.otagogeology.org.nz/items/show/621.